Maruti Suzuki India is India’s largest automaker with many segment leading cars in its portfolio. The latest addition to its popular segment leaders is the Maruti Ertiga which is hardly one month old in India if we consider its official Ertiga launch date of 12 April 2012. Within a month of its launch, the Ertiga has already crossed 32,000 bookings which is a remarkable number for any new car in any segment. When we saw Ertiga cross 10,000 bookings mark after about 1 week of its launch, it was known that this car has attracted a lot of buyers attention towards itself because of a unique placement and value proposition for large family buyers looking for a larger than a 5 seater but not a full fledged MPV. Ertiga combined the frugality of a premium hatchback to the space of a 7 seater at a lucrative price point coupled with both petrol and diesel engine options and various feature sets in 6 trim levels with 3 in each petrol and diesel engine options. The combination of all these factors has made Ertiga reach such demand levels so quickly. But the downside of this high demand is long waiting periods which will follow once the supply (which is limited by production capacity) will fall short of the demand. While Maruti makes about 6,000 Ertiga MPVs in one month, it will take 4 to 5 months to deliver the bookings received in the first month itself. If the bookings keep coming at pace higher than 10,000 units per month, the waiting period will remain longer than a couple for months which is quite irritable at timed for car buyers. Although it is expected that with high demand for Ertiga, Maruti will increase the production of this car if the demand sustains higher levels. It is not new for popular Maruti Suzuki cars to have long waiting periods, Maruti Swift Diesel tops the charts when it comes to the waiting periods in small cars with as much as 6 months waiting time. 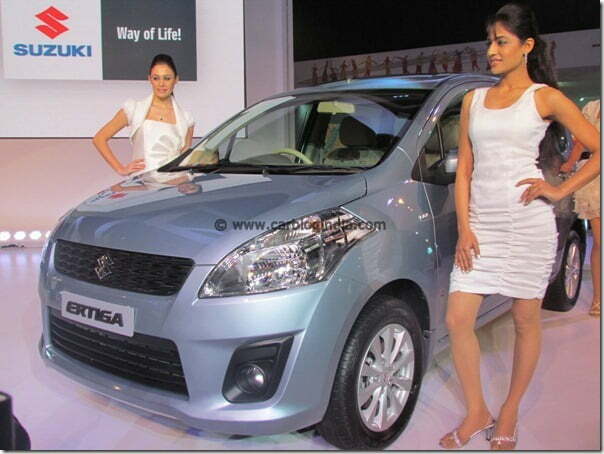 The Ertiga has been launched at an introductory price of Rs. 5.89 Lakhs for Petrol base variant and Rs. 7.30 Lakhs for Diesel base variant. At this price, the Ertiga is a very lucrative MPV as the larger MPVs like Toyota Innova and Mahindra Xylo are comparatively more expansive and Ertiga also delivers better when it comes to fuel economy. Since the Ertiga is a much higher value for money especially at the introductory prices, it is one of the reasons for such high demand. Just like we saw in the case of Swift Dzire Diesel and new Maruti Swift, the price hike is expected to follow in just a couple of months after the launch, so the Ertiga is also expected to cost more after a few months.